Run this to stop your old pages falling off the face of the Earth. When updating old blog content for SEO, the first step should always be to record the old post's details. Use the form fields below (and add any if necessary) to do so easily. Now you need to rewrite out-of-date paragraphs. Use (and expand) the sub-checklist below to record your progress. Now you need to add links to your new content. Record the content you've linked to with the form field below. Updating your links is worth the time it takes, because it shows Google that you're referencing fresh, relevant material AND it helps rank the posts you've since written by getting that sweet deep link juice a' flowin'. There's no point in updating old content for SEO if you don't update the title to include the keyword. Record the new title in the form field below. 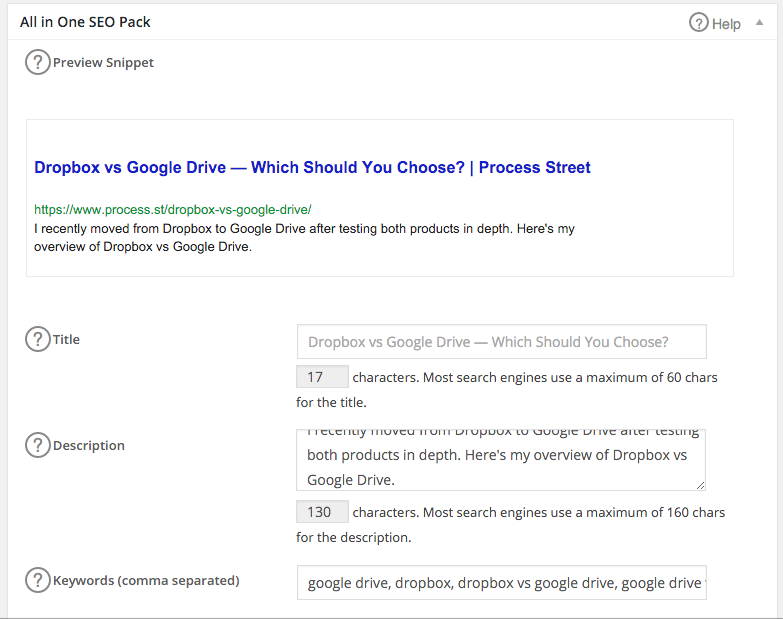 Putting the target keyword in the post's title is the single biggest thing you can do to signal to Google you've written about that exact thing the searcher is looking for. There's also no point in updating old blog content for SEO if the slug for the post is an unwieldy mess - you now need to make sure that the slug for the post is nothing but the keyword. Record the new post address in the form field below. Not only is it unwieldy, if it doesn't include your keyword you're not doing your SEO any good. This is pretty self-explanatory, but you need to include the keyword of the post in the first 100 words. Again, self-explanatory. This time, you must ensure that the keyword is specifically stated in at least one of the post's sub-headings. Now you need to edit your metadata to include your target keyword. 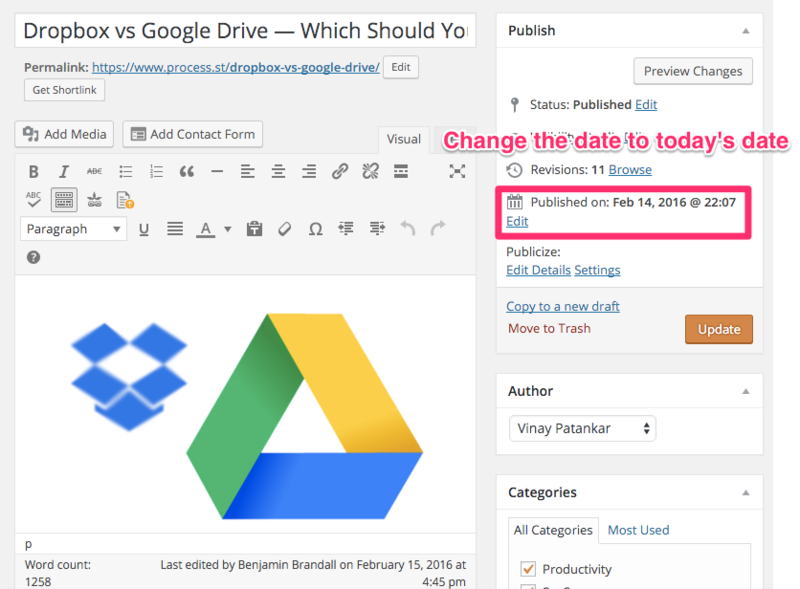 Now you need to edit the publish date of your post to the current date. Remember to record the new date using the form field below. The next step in updating your old blog content for SEO is to ensure that the post has now been bumped up to the first page of your blog. Depending on your blog's setup, this may have automatically occurred when you edited the publish date. If this is the case, you need to at least check that the change has taken place. Now that the content is entirely updated and has reclaimed the first page of your blog, you need to email it once again to your subscribers. Make sure that the email is also updated to reflect the new content - no subscriber enjoys old, irrelevant content pushed into their inbox. It's once again time to run your promotion process on the post in question. Record the status of the promotion process using the dropdown form field below. If you don't have a promotion process, get it here. The final step in updating your old blog content for SEO is to track the new search ranking for at least a week. Congratulations! You're finished updating old blog content for SEO. Or, at least, you're done with this post. On to the next one!